A strong plurality of voters think congressional Republicans are moving too quickly to overhaul the nation’s health care system, according to a new Morning Consult/POLITICO poll, which also shows that Obamacare is more popular than the GOP alternative. With the House likely to vote Thursday on the GOP health care bill, 43 percent of registered voters think the GOP in Congress should slow down in replacing the Affordable Care Act. Just 17 percent of voters think Republicans, who aim to have the bill considered on the Senate floor next week, are moving at the right pace on health care. 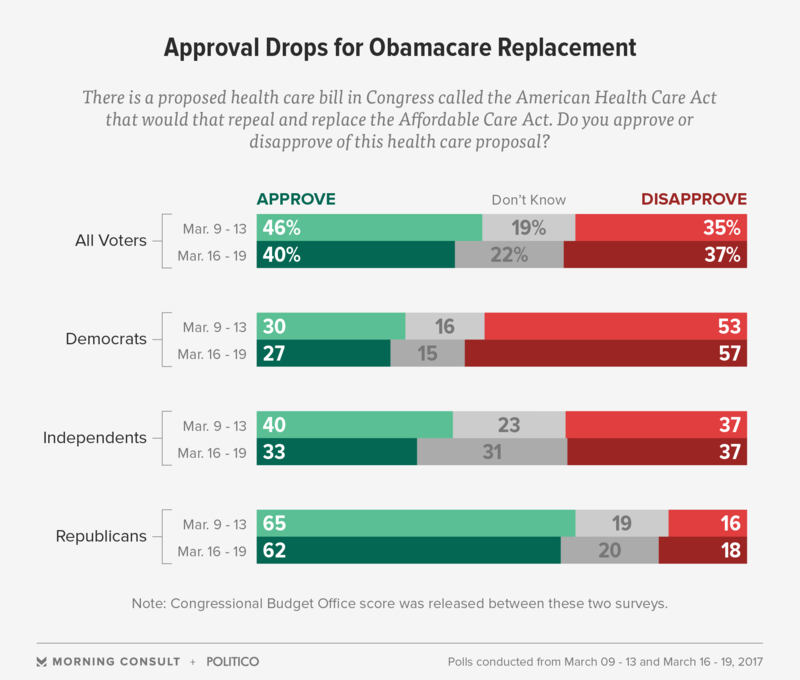 Not even GOP voters are firmly behind the Republican timeline for replacing Obamacare. A third of Republicans think the replacement is moving through Congress at the right speed, while 28 percent want them to slow down. Twenty-four percent of GOP voters think congressional Republicans are moving too slowly. Since the Congressional Budget Office released its cost estimate of the Obamacare alternative last week, showing steep coverage losses, the legislation’s approval rating has dipped six points, from 46 percent to 40 percent. 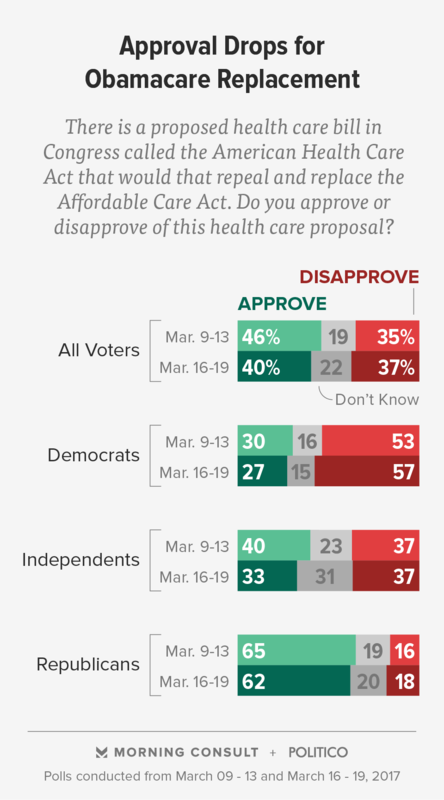 Obamacare’s approval rating, on the other hand, sits at 46 percent, as it did in February. A plurality of voters (39 percent) also think the legislation, dubbed the American Health Care Act, would increase health care costs for their family, while only 1 in 5 voters think it would make their costs go down. Voters were split on how the bill would affect the quality of their health care, with 32 percent saying it would become worse and 28 percent saying it would become better. Additionally, 36 percent said the health care system would be negatively affected, compared with 30 percent who said the system would improve if the GOP bill becomes law. While the popularity of the GOP bill has declined since the release of the CBO score, some of the budget office’s predictions were met favorably by voters. Half of respondents said they were more likely to support the bill because the CBO predicted it would rein in federal deficits by $337 billion in a decade. In addition, 52 percent of voters said the estimate that average premiums would eventually decrease by 10 percent made them more likely to back the bill. As expected, voters responded negatively to the predictions that millions more people would be uninsured and average premiums would rise in the short term. Fifty-three percent of voters said they were less likely to support the legislation when taking into account the CBO estimate that it would lead to 24 million fewer people having health insurance in the next decade. And 59 percent of voters, including almost half of Republicans (49 percent), said they were less likely to support the bill because the CBO projects it could increase average premiums by 15 to 20 percent in its first two years after becoming law. The online survey was conducted from March 16-19 and consists of a national sample of 1,927 registered voters. It has a margin of error of plus or minus 2 percentage points. Crosstabs are available here.